Beanetics has got me hooked. On coffee. The last time I was hooked was when I went to vacation in Italy. Ever since then, most coffee has been pretty blah or just plain bitter. But this summer I thought I’d cut back on my Coca-Cola consumption and drink coffee instead. My wife went online and researched the best places to find good coffee beans. Also, how to make coffee. I had never really learned how to make good coffee. We settled on using a Bodum Champbord 4-Cup French Press with matching Bodum Antigua Burr Coffee Grinder. So the next step was find good beans without going to Italy. So we checked out a few places and tried a few different beans, but the best by far was Beanetics. 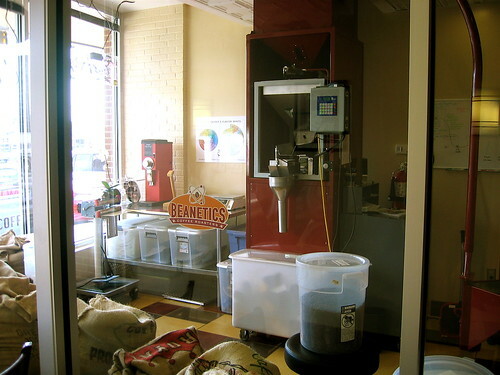 Beanetics is a micro roaster in the Washington DC area, Annandale, VA to be exact, which is not too far from where I live. I had never heard of a micro roaster before, so I was pretty curious what that actually meant. I’ve been to micro breweries. I used to work for a company based near Portland, Oregon which probably has more micro breweries per capita than any place on earth. So a micro roaster is basically a shop that roasts their own coffee beans. That way you get the freshest roasted beans and the result is that your coffee tastes REALLY good. They’ve got quite a few different beans they roast and also blends of beans. Plus of course they serve good coffee, they’ve got Wi-Fi, a few tables, and coffee equipment. I bought my grinder there. The staff is pretty helpful and friendly too. Its also an Indie business, which I find refreshing in the age of franchises. I think the backstory is that two guys got together and wondered why there wasn’t better coffee in the Northern Virginia/DC area and so they started up Beanetics, which opened up just a few months ago. BTW, my favorite beans are the El Salvador beans. They’re the sweetest. I’m trying out the Mexican right now and I hear that the Costa Rica is the most popular. Anyways if you like coffee and you’re in the area, go check out Beanetics! I’ve bought beans from them a number of times and find that they do not sell fresh beans. I’m also a home roaster, and I know the value of beans that are less than a week old. I really WANT to like this place, and maybe they’ve pulled it together, but as recently as September could not get anything fresher than two weeks old. I don’t home roast so for me, its perfect. Definitely far superior to Starbucks or grocery store roasts.